Known as the “King of Spices,” pepper is one of the oldest and most popular spices in the world. 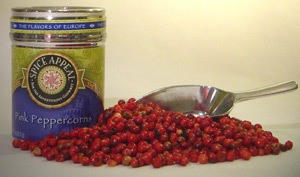 Once native to the Andean deserts of Peru, pink peppercorns are now commercially grown on the French island of Reunion. Often considered more fashionable for their appearance than flavor, they add a touch of color and rich, sweet hint to almost any dish. Tasty in Mediterranean cooking.